Description: 32" SxS barrels of Chromox Fluid Steel by AH Fox Gun Co. Phila Pa, with twin ivory beads and slightly-concave matted rib, choked full & full. 28" SxS #4 barrels of AH Fox Chromox Fluid Steel by Savage Arms Corp Utica NY, with single steel bead sight and slightly-concave matted rib, choked extra full & extra full. 14 1/4"pull from front trigger to red rubber Silvers recoil pad, 1 1/2" - 2 1/2"drop. Trace of cast-off. Figured walnut stock with half pistol grip, two splinter forends with Deeley pull-down latches and horn inserts, D-pattern fleur-de-lys checkering and with checkered sidepanels. 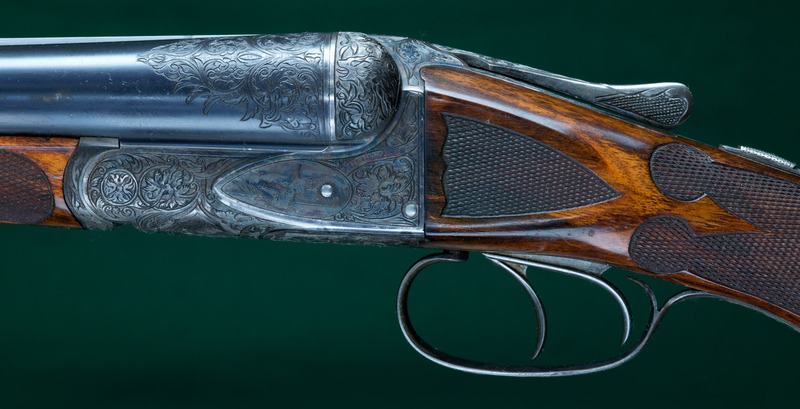 Fully scroll engraved with Fox's second generation "art nouveau" type engraving, probably designed by William Gough and with a setter on bottom, a pair of quail on right and a pair of grouse on right. Scroll on both barrel sets to 2" from breech. Vacant initial shield on triggerguard. 2 3/4"chambers. Automatic ejectors, hold-open toplever and automatic top tang safety with SAFE in gold. Weights: 8lbs, 2oz with 32" and 7lbs, 7oz with 28" barrels. 98% barrel blue, 70% receiver case colors, 40% triggerguard case colors. In original black hard trunk case with accessories. Provenance: Shipped from the Philadelphia factory Dec 9, 1922 to Boston Fox distributor Bob Smith. Edward Villray Papin, Rye Beach, N. H. (Great-grandfather of MLH4). Literature: Shooting Sportsman, May/June 1997, page 49.